Special Price - 40% OFF! Belleek shamrock shaped wall plaque is an embossed design that features hand painted shamrocks. 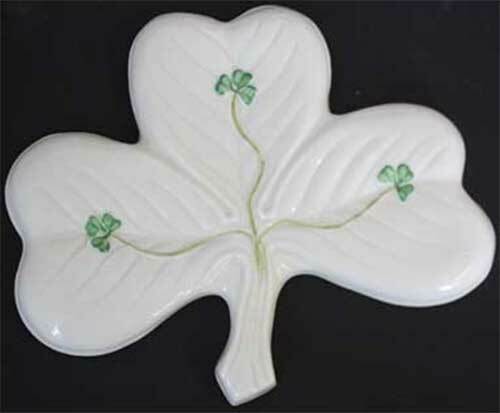 The Belleek China shamrock plaque was introduced in 2012. The Belleek shamrock plaque features hand-painted green on its embossed and dimensional surface. The Belleek shamrock is made of fine china and measures 5 1/2" tall x 6 1/4" wide; the plaque is ready to hang on your wall. Belleek Celtic plaque is a fine china Trinity knot that is enhanced with embossed detailing along with hand painted shamrocks. Irish horseshoe features shamrocks along with a blessing of good luck and it may be carried by a bride or serve as a wall plaque. Belleek blessing plaque for the home is an embossed wreath design that is enhanced with green shamrocks.